Diversity is both an issue of fairness and, some say, a driver of innovation and performance. To assess the latter claim, we undertook a large, cross-country study into the relationship between multiple aspects of managerial diversity, the presence of enabling conditions such as leadership support for diversity, and innovation outcomes. We surveyed more than 1,700 companies across eight countries (the U.S., France, Germany, China, Brazil, India, Switzerland, and Austria) and a variety of industries and company sizes, examining diversity in management positions, measured with respect to gender, age, national origin, career path, industry background, and education. We partnered with the Technical University of Munich for the statistical analysis of the results. We examined the correlation of these variables both individually and collectively, with the percentage of revenues coming from products introduced in the last three years as a proxy for innovation impact. Innovative companies are taken to be those with fresher product portfolios, and unsurprisingly they turned out to be more profitable, too. We found that indeed there was a statistically significant relationship between diversity and innovation outcomes in all countries examined. Furthermore, the more dimensions of diversity were represented, the stronger the relationship was, although the precise patterns of diversity and performance were different across cultures. We also found that diversity had gained momentum as a topic in more than 70% of the enterprises surveyed, especially in developing economies. Most important, we found that the most-diverse enterprises were also the most innovative, as measured by the freshness of their revenue mix. In fact, companies with above-average total diversity, measured as the average of six dimensions of diversity (migration, industry, career path, gender, education, age), had both 19% points higher innovation revenues and 9% points higher EBIT margins, on average. All six dimensions of diversity had statistically significant correlations with innovation, both individually and collectively, although industry, nation of origin, and gender had slightly larger effects. And the effects of different dimensions of diversity were mostly additive, with the exception of educational background/age and career path/industry, which were somewhat correlated. Based on these findings, a broad-based approach to diversity that values multiple aspects of diversity is therefore most beneficial in terms of innovation outcomes. When we looked at the enabling conditions for diversity, including fair employment practices (such as equal pay), participative leadership, top management support for diversity, and open communication practices, less than 40% of firms employed them. And not surprisingly, firms that had such practices in place had better diversity scores, and as a result better innovation performance. This strongly suggests that diversity represents a tangible missed opportunity and significant potential upside for most companies. In total, the presence of these enabling factors is worth up to 12.9% points of innovation revenue. What is the potential impact of diversity for the average respondent company? 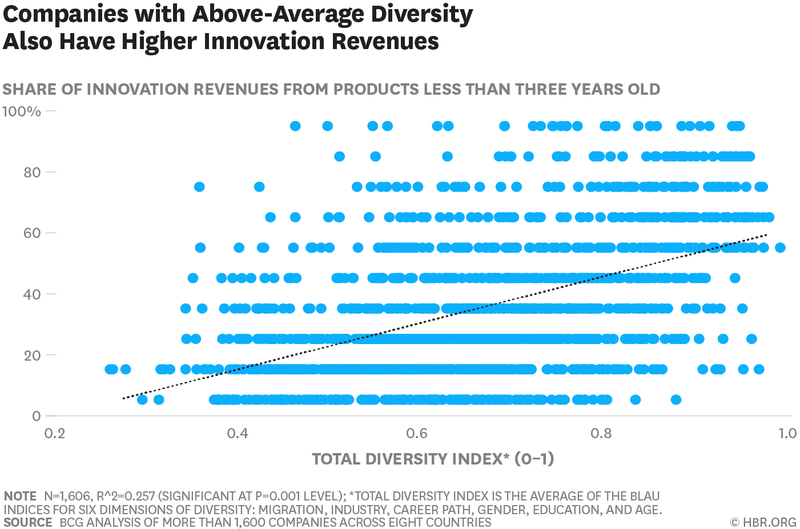 We calculated, based on our survey data, that innovation revenues could increase by 1% by enriching the diversity of the management team, 1.5% with respect to national origin, 2% with respect to industry origin, 2.5% with respect to gender, and 3% with respect to managers with different career paths. With greater increases on more dimensions, the total uplift potential could therefore be even more significant. Given the importance of globalization and technology as drivers of performance, we also looked at the impact of these two factors on the relationship between diversity and performance. We found that the diversity impact was highest for companies that had a high emphasis on digital innovation, as measured by their digital investments as a proportion of operating expenses. This is perhaps not surprising given the high innovation potential and low degree of maturity of the digital technology. With many companies playing digital catch-up, we believe that diversity is an underappreciated and underexploited tool for magnifying innovation efforts. We also found that the relationship between diversity and innovation was stronger for companies with significant operations and interests in multiple countries. This is also not surprising, since global companies are in a better position to tap into and exploit the impact diversity, if they proactively avail themselves of the opportunity. The relationships between innovation and diversity that we uncovered were strong in all geographies, although the picture was quite different in each case. Not only did the starting positions on each dimension of diversity differ, but their relative emphasis and degree of impact did, too. As a result, the success patterns for innovation through diversity were distinct country by country. On starting position, educational diversity was, for example, significantly less in Germany than in India, likely due to higher overall educational levels. The emphasis tended to be on inherent dimensions of diversity like age and gender in developed countries like the U.S. and France, but was more on acquired diversity dimensions like industry and educational background in developing countries like India, China, and Brazil. In terms of impact, diversity of national backgrounds was a stronger driver of innovation in France and the U.S., whereas diversity of industry background was stronger in Brazil, China, and India. Thus, there are multiple paths to harness diversity, irrespective of differences in culture and starting point. There has been much justified criticism recently that “structural diversity” in terms of equal access to senior jobs and equal pay for people with different backgrounds is not advancing rapidly enough. Perhaps the strong relationship we have found between diversity, innovation, and performance adds some additional economic and technological motivation to address the gap. Diversity has sometimes been critiqued as a culturally normative concept. Our results show that diversity can drive innovation performance in countries as different as Germany and India, however. Moreover, they imply that it can so do in a variety of ways. So the secret of making diversity work appears to be to apply the concept at multiple levels — to address diverse dimensions of diversity, and to be open to diverse routes to achieving success. Of course, the correlations we observed are not guarantees that human diversity will drive innovation. The power of diversity still needs to be unlocked with enabling practices, like a non-hostile work environment, an inclusive culture, and a culture where diverse ideas resulting from a diversity of backgrounds are free to compete. Du musst angemeldet sein um kommentieren zu können.